But how do you unlock these? The unlocking is the most interesting change. I do like the big buffs that the tech gives though. Does the ai have to meet the prerequisites to unlock the technology too? Another side note. If you still have time, I would put a red background on the food upkeep icon Healthcare. Since it increases cost there should be a visual indicator. "Strat Clut technologies"? Does that mean Gwined has a different tech tree? Agreed that these seem much more powerful which is good, especially if they have specific requirements to unlock. Seems to be a good reward for whatever the effort is? To echo... The question definitely is, how do we obtain these? Yes, I am one of those people who liked Rome 2 and yes my opinion is still valid. that 'church music' description is a doozy. (a) I seriously doubt any chant in the history of all civilizations everywhere, up to maybe the 20th c., was 'monotonal,' i.e. sitting on one note that never changes. Chant was originally a heightened kind of 'performance speech' for delivery poetry, religious texts, etc, and would have had, from the beginning, all the inflections and pitch changes associated with that. Gregorian chant, as would have been in use by this time, was definitely not monotonal either. If you're looking to describe single-voice/single-melody unison singing, the word is 'monophonic' (one-sound), not 'monotonal' (one-note). (b) Hymns would have already been a part of services. However, until much later than this period, they would have been in chant, not a distinct style. (c) church music was beginning to evolve around this time, but the developments are mainly associated with France, and, again, didn't depart from chant-based styles for quite some time (look up 'parallel organum' if you want more on this). (d) it sounds like you're trying to get at the concept of how more popular-style religious music was used to promote religion. This did happen (extensively), but it would have mainly been used outside of services in the context of e.g. religious instruction, festivals, etc. Wiki says carols started in the 12th c., but I'm sure there were predecessor genres. Is there a way to enlarge the screen? Click the pic, then click the magnifying glass. Like the look of this. One thing that I saw was +15% range for archers, I would prefer to see a buff to accuracy or rate of fire instead. I feel that a range buff needs to come from first an improved bow and then training to use it. Could be a change from using hunting bows to the use of war bows would be better for a range buff, training for an improvement to accuracy and rate of fire. Good design and love the idea of technologies being locked. i look at the 'Master Spearmen' tech; i wonder - in a setting dominated by infantry shield on shield warfare - will spearmen have an actual use? ---Furthermore i am of the opinion, that the current Unit Count(20,21) must be lifted!! new innovations in the ToB campaign look very promising! skirmish need that kind of revamp too! you've already made the tools! just make use of them! * add "large army" option to quickmatch pls! Spears were cheap to use and equip armies with. Also according to this website spears were the most common weapon of Viking Age. Spears were the most common weapon of almost all pre-gunpowder eras. The problem lies in the context of TW where Spearmen are inferior to swordsmen of the same type. The only TW game to properly have Spears be better than swords in a frontal engagement as far as I can tell is rather ironically TW:Arena, where they will beat any infantry when in Phalanx formation. One note about the range increase tech. Since this is based on Attila which is in turn based on Rome 2 please check that the range increase effect is actually working. It didn't work right in Rome 2 or Attila initially. In the power and politics patch for Rome 2 it was partially fixed but not enough to get it to work in an actual battle. For this effect to work right it will need fixed from the Attila base behavior and it will also need to go further than the Rome 2 changes because those didn't end up actually fixing the issue either. I want real time battles as soon as possible. I want this game to succeed but I'm worried so far about what I'v seen. ABOVE: Soviet officer Alexey Yeremenko leads his men into combat. He was killed seconds after this photo was taken near Voroshilovgrad, Ukraine - July 12, 1942. 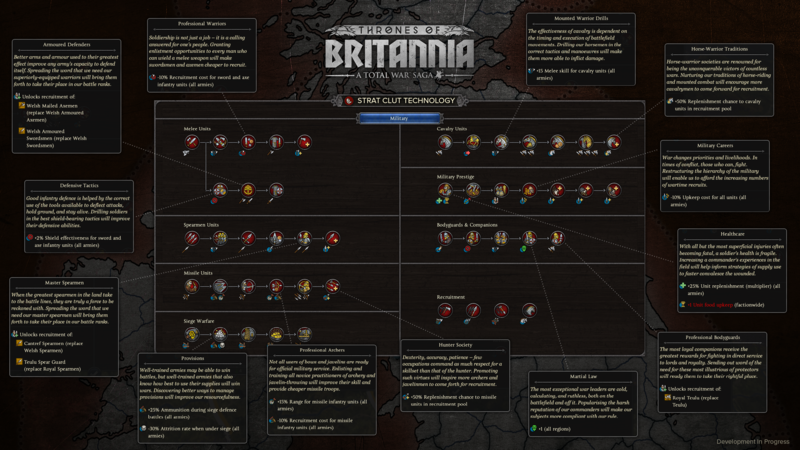 I believe in other games like Attila as missile units gain experience they improve accuracy. Higher range than the enemy can be big if you are smart about how you use your archers. Yeah, I feel something it's misplaced in this blog. 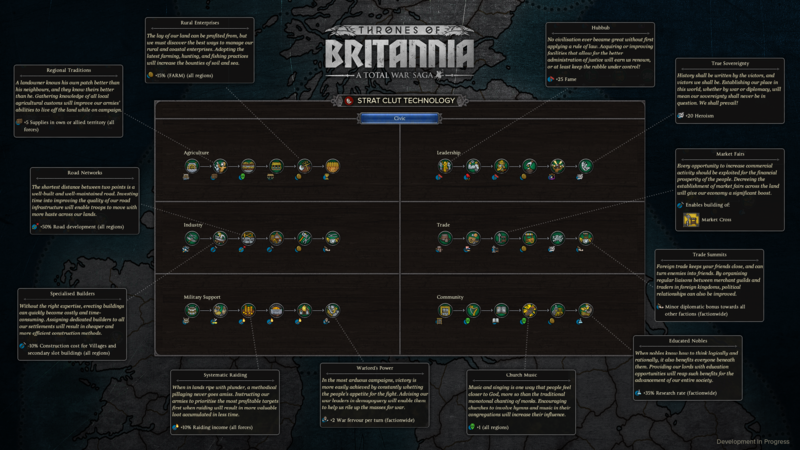 The main way the tech tree varies between factions in Thrones is in terms of the unlocks. Take the Community line of techs, to unlock those upgrade the Monastery chain or one of its variants, or conquer a settlement with the top tier version of one of those buildings in it. As Mide for example easy, your capital has the St Ciaran chain as its main building so unlocking that tech line is simple. But for a faction like West Seaxe it's a lot harder. The only Monastic settlements are in Ireland and Scotland, so far away from where you start. I like the new system. It reminds me of something I read about Genghis Khan when he invaded Persia. The Persians thought they could be safe inside their walled cities because their previous contacts with the Mongols was with nomadic, uneducated cavalry incapable of building siege engines. Unfortunately for the Persians the Mongols had conquered China and Genghis Khan spared artisans and made them part of his army or sent them back to Mongolia. He had Chinese engineers with him. He gained the technology by capturing the area where the technology existed and enlisting the engineers. Genghis Khan was a fascinating character. Extremely violent sociopath on the one hand but very smart in other ways. He also had an early version of the pony express to exchange messages with his distant armies quickly.